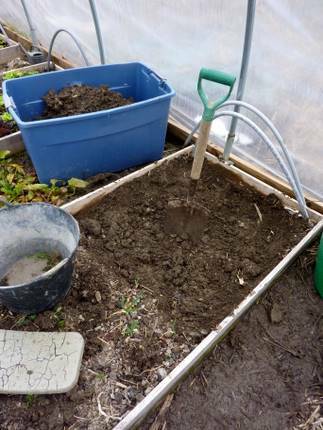 I have two 6’x3′ beds in the new greenhouse that are destined to get the hot-bed treatment. Shovel Season is quickly approaching, so I might as well take this opportunity to get in shape for it, too. Heave ho! First step is to evict the resident lettuce, arugula, endive and escarole. Potato onions at bottom of frame get to stay. And now I wait. 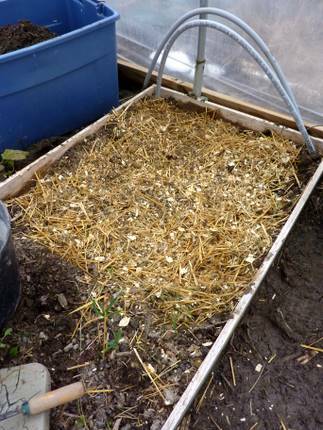 The microbial action of the mixed turkey, chicken, bunny and goat poo eating up the brown bedding material should happen quickly. The point of this is to raise the temperature of the soil to a level that the seeds spring with life. Ambient greenhouse temperatures range from 50-90*F in the daytime, with nighttime lows in the 40s. The “normal” soil temperature, untreated, is around 55, which is quite fine for seed sprouting. I expect this hot bed to jump to about 70, which means quicker germination. 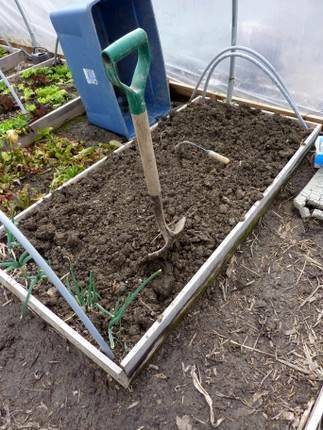 This bed has been seeded with quick crops (turnips, radishes, spinach, arugula, lettuces) and transfer crops (broccoli, cabbages). Nobody gets a long stay, in other words. They’ll all be in and out by the first week of June. Then, the bed gets the hot stuff (tomatoes, peppers, eggplants and okra). You don’t need a greenhouse to do this, of course. 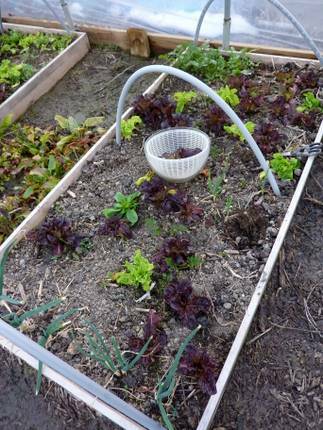 As long as you don’t have heavy, wet soil, you can do this in an outdoor bed. I would tent it with plastic, as long as you vent it in the hot part of the day. How have I never heard of this before? So you just use this for germination and then move them elsewhere and start another round? Brilliant! This is on my list for this week, too. Spring has sprung! Well, almost. That is a great idea! Wish I would have thought about it myself! I’m going to give it a try. Hot poo. You are amazing. You can come to California. Pitch a tent in my yard. Do not pay taxes there anymore! Brett! 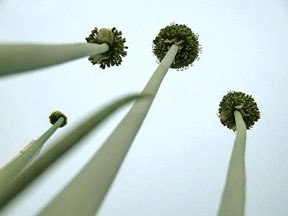 They’re below-the-soil-line bunching onions. Mini bulbs that’re a pain to peel but! they last forever, perpetuating themselves. I move them around frequently. These were babies last fall but this fall there’ll be a good 1-2lb harvest under each. I do believe I spy a Ho-Mi in the 4th picture. I received one as a gift last year unsolicited and now it is one my most used tools….everyone should own one. I finally got one too–at a fundraiser for a gardening group at our expo this year! So far I like it a lot. Cool- That post was before I found you here. I concluded it was worth keeping when I pulled my first garlic last summer and found that it became the “go to” hand tool before too long. The other relatively unique Asian tool I’ve become attached to is the Kana Scraper I found @ Hida Tool. It’s the best “quick weeder” I’ve found for tight spots around tender shallow rooted plants. The long handled version = less bending over (and it has a narrow handle for small hands). Excellent suggestion..tunnel planting is now on my list for the weekend. It’s nice to have a never ending supply of creature poo lying about…I’ll remember that as I’m cleaning stalls. 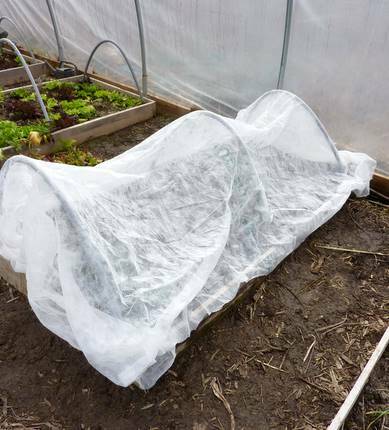 El, reckon I could sow some seeds, put plastic on top of them on the ground, wait until they sprout, then make a mini row cover over them to keep them warm until it really warms up down here? I thought the plastic over the ground to heat it up a bit to germinate the seeds. 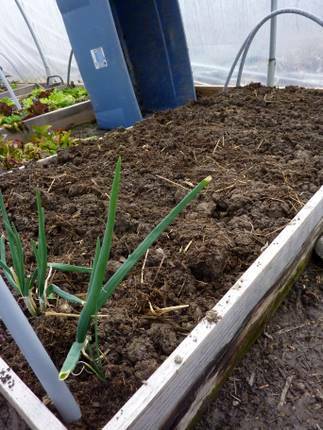 Or should I put the plastic down first, warm the soil, then sow? I’m talking carrots and radishes and such, maybe even corn. Jules, your soil is probably warm enough that you can direct-sow just about anything. Making a mini-hoop of plastic will speed things along, but, as you know, your cold doesn’t last very long down there, so it might help just to get things going! As long as it’s not freezing at night, the corn can be sown now. Everything else you mentioned too. Hi All: This is a traditional way of planting things, incidentally. The French are famous for it,and if you ever want to grow things like melons or squash in a short season, it helps immensely. But indeed I often have beds I consider holding pens, seed-starting beds, that just grow things out to the true-leaf stage…then get transfered to their main areas elsewhere. Shannon, indeed. Please realize that I HATE planting seeds and sticking them under lights, so…I go to lengths to avoid it! Diana, did you get things started? I tell you I have been finding it hard to do my paid work now that it’s the spring tease. Todd, do. It should hurry things along! CC, well. I am really scratching my head about the whole dealio. How we can follow up Granholm with a mental midget like Snyder just proves that I know nothing about my home state. But it’s a grand conspiracy, s’all I am saying, between all these midwest wingnut goverrnors. Cohutt! Goodness, thanks for clueing me in on yet another tool I could probably find handy…thanks? I guess? Sara, glad you like it too. I think it’s really handy, even if it’s rather lethal-looking. Pamela, I think about how much happier my gardens have been since I have had creatures. The first year we had bupkis, then 5 chickens the next year but my goodness the addition of the goats? Fabulous!! Bunnies too though I don’t like to admit it. “Friends with benefits,” all. Jules, hope that helps. Geddonit! Brett, now wouldn’t that be fine?? Yeah, you see, I need a multi-pronged attack on the onion family to keep the pantry well-stocked and us well-fed. The potato onions are a new-ish addition (3 years) but they’re quite handy.